Kaspersky Internet Security 2014 keeps your PC safe from all viruses and Internet threats. It is a full security solution that rigorously protects your files and your identity from cyber criminals and the latest malware attacks. By combining cloud-based functionality and powerful security technologies that run on your PC, Kaspersky Internet Security 2014 delivers more effective defences against today’s increasingly complex threats – so you’re able to enjoy the Internet, while Kaspersky protects you, your PC and your children. In addition to including all of the features offered by Kaspersky Anti-Virus 2014, Kaspersky Internet Security 2014 delivers many innovative, new technologies that are essential to defending you against sophisticated threats on the Internet. With Safe Money, Secure Keyboard and other unique features, Kaspersky Internet Security 2014 does more to help ensure you can get the best out of the Internet… without compromising your safety. If your PC has application or system vulnerabilities that haven’t been updated with the latest fixes, cyber criminals and malware could gain entry. In addition to scanning for vulnerabilities, Kaspersky Internet Security 2014 analyses and controls the actions of programs that have vulnerabilities – so they can’t cause any harm. Kaspersky Internet Security 2014 is fully compatible with Microsoft’s latest operating system – Windows 8 – and is integrated with Microsoft’s latest IT security innovations. 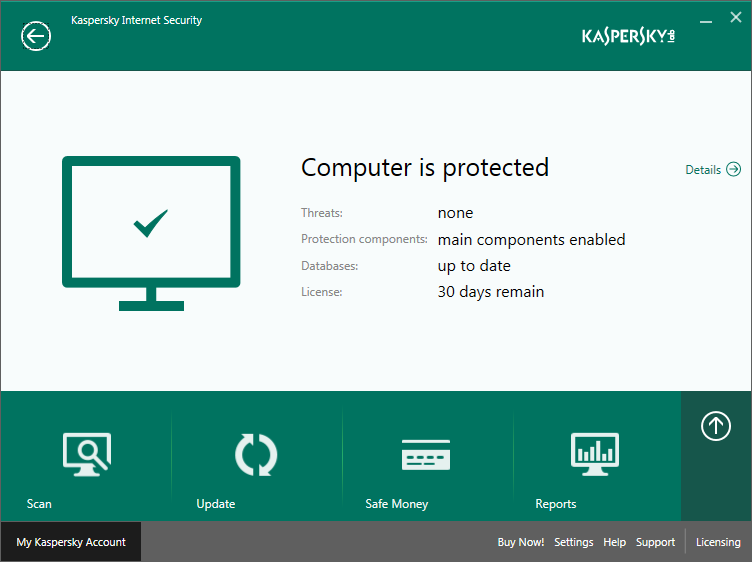 In addition, Kaspersky Now – a new application that has been developed to support Microsoft’s new user interface – lets you monitor your PC’s security status and launch vital security features.